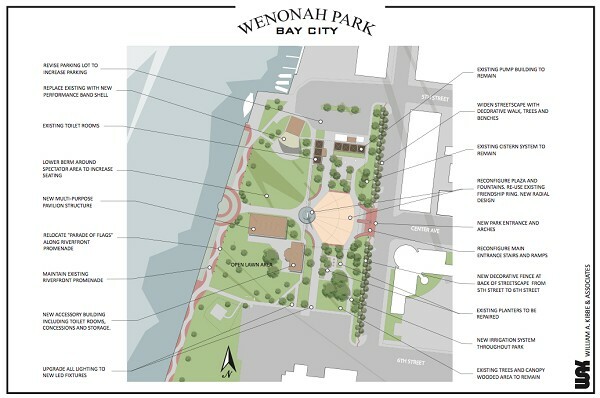 New design of renovations and improvements for Wenonah Park goes to city planners Wednesday night. A new design for a 5,000 square foot pavilion/skating rink in Wenonah Park, almost directly west of the foot of Center Avenue, but nearer the river, will be up for approval by the City Planning Commission Wednesday at 7:30 p.m.
An online posting by MLive.com drew several criticisms, appearing to mimic the acrimonious debate of the past weeks and months over the issue. Opponents seems to focus mainly on the idea that the buildings will block the view of the river from Water Street, without noting much concern about costs for a large share of costs. If planners approve, the $6.6 million project could be up for City Commission approval within a month, according to Andrew Dodson of MLive.com/The Bay City Times. Dodson also penned a sidebar noting the history of the proposal, stemming from research by DDA Director Candace Bales on a similar facility in Manassas, Virginia. 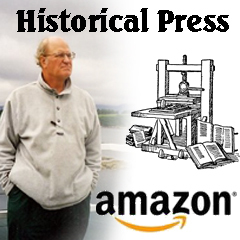 Bales was impressed by the Manassas project that seems to have revitalized the once moribund downtown area of that Virginia town, famed as the site of two important battles of the Civil War. Taxpayers of Manassas anted up $2 million to build the pavilion and, while the Nickless Family Foundation has allegedly offered a $1 million grant, city residents are waiting for the other shoe to drop on costs they will have to bear. The DDA reportedly has about $800,000 that it may be willing to spend on the pavilion and ancillary buildings. That would leave an estimated $4.7 million for the cash-strapped city to raise if the project is to move ahead. State Theatre/Bay County Historical Museum impresario Mike Bacigalupo says he has identified another possible $750,000 donation that could lessen the taxpayer costs if the project is green-lighted. The State Theatre is potentially positioned to manage the pavilion/skating rink, along with a new much needed new bandshell, according to earlier city discussions. It would appear that unless City Manager Rick Finn, Mr. Bacigalupo, Ms. Bales or other officials can come up with a source of funding -- a golden goose as it were -- this project is on a very dicey path. Nevertheless, it seems to have merit under its present configuration as Wenonah Park as it stands is not a destination attraction, except for the Appledore dock and the bandshell concerts. As some people have stated on mlive this seems to be a done deal except for the funding. The majority seem to agree that it should be built over in Vets Park but they miss the point that it's the DOWNTOWN Development Authority that's doing the proposing. The city fathers pay attention to them most of all and seem to let the other commercial neighborhoods do their own thing. Shouldn't they be trying to build them up too? Bay City doesn't have just one commercial area it has many but I don't see money funneled their way.